Offers: Various Stay & Play offers plus Golf School offers. Emporda Golf Club was founded in 1991. Robert von Hagge skillful design has managed to integrate the playing area into a Mediterranean landscape of great natural beauty made up of pine woods with exuberant undergrowth, lakes, dunes, large bunkers and broad rolling fairways. The many lakes on the golf course are Empordà most characteristic ecological areas. Some are man made and others natural, although all are extraordinarily diverse ecosystems with well-developed lake vegetation and abundant fauna characteristic of these systems, such as aquatic invertebrates, fish, amphibians and, above all, birds, both native nesting species and migratory species. The Empordà Golf course offers a total of 36 holes, divided into two separate 18-hole courses: Links and Forest. The Links style course has two large lakes, dunes and rolling bunkers in a classic Mediterranean landscape replete with dense, manicured pine stands and spacious fairways. 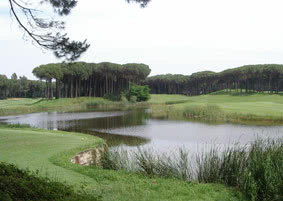 The Forest course is more Mediterranean in style and winds invitingly through pine trees and lakes. In the late 1990s, Empordà Golf was named one of the 10 best courses in Spain. It was moreover ranked 13th for design in all of continental Europe by “Peugeot Golf Guide 1996”. EG was made the permanent headquarters for the PGA Pre-Qualifying School II European Tour and, since 2002-2003, has hosted the PGA Qualifying School European Tour Final.